Русский народный орнамент. Учебное пособие. 6-е изд., стер. Vladimir Vassilievich Stasov (1824 – 1906) was a prominent art and music critic, art historian. His book "Russian folk ornament" was first published in 1872 in St. Petersburg. 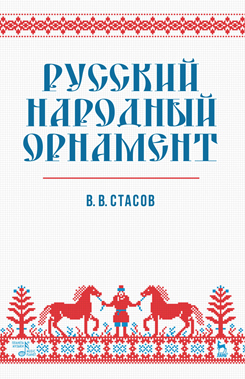 The book presents a Russian folk ornament in embroidery, fabrics and lace. In his work Stasov suggested the significance and depth of Russian folk art, being one of the first to draw attention to it. The textbook is destined for fabrics and clothes designers, reseachers of Russian folk art, teachers and students of art colleges and high schools.